"We should cease to talk about who owns the farm in terms of colour," he said. "It is criminal talking about that. A farmer, a black farmer, a white farmer, is a Zimbabwean farmer." Mr Mnangagwa's move to ease the concerns of white voters comes ahead of historic elections on 30 July. 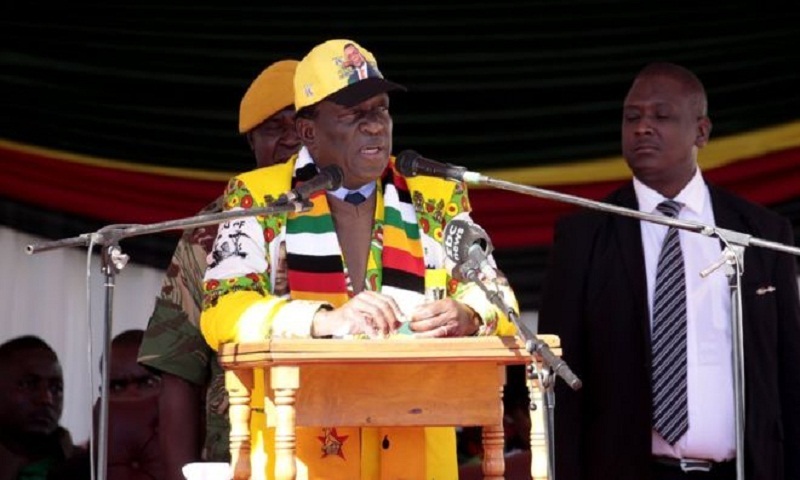 White Zimbabweans have traditionally voted for opposition parties such as the Movement for Democratic Change (MDC) as opposed to Mr Mnangagwa's Zanu-PF party. The farm seizures led to a crash in Zimbabwe's agricultural output, an exodus of skilled white farmers and widespread unemployment among black farm labourers. There are more than 120 political parties registered for this month's elections, and there are likely to be 23 presidential candidates to choose from on the ballot. Mr Mnangagwa is favourite to win the poll, but analysts say he also has enemies - both for overthrowing his former mentor and for being a previous enforcer of Mr Mugabe's government. The main opposition leader is Nelson Chamisa, 40, a lawyer and preacher who rose to the top of the MDC in February. He is hugely popular, especially among the young and unemployed, and would become the country's youngest ever president if elected.